This list was almost as much fun to put together as the Five Things to Remember list. A sick, sadistic type of fun, but fun nonetheless. 4th and 26. This one is pretty much read. I mean, come on, really? Fourth and 26? And you give up the first down? While that play was horrendous, this i s about more than one play. 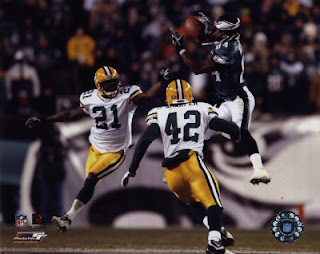 There was the goal line situation when the Packers should not have gone for it when they did (and were stuffed), when they had 4th and 1 at Philly’s 40 or so and didn’t go for it when they should have, of course 4th and 26, Favre throwing the pick in OT, etc. This game was a clusterf*ck personified by the clusterf*ck of clusterf*cks. Speaking of the f-bomb, right after Freddie Mitchell caught the 4th and 26 pass, I dropped a very emphatic, very loud f-bomb right in front of my mother. This normally would have upset her quite a bit, but I think that I was pretty much speaking for the entire state of Wisconsin at that moment. F*CK! Fourth and f*ckin’ 26?!? You gotta be f*ckin’ kidding me!!! Ok, I feel a little better. Southwest Missouri State 43, Wisconsin 32. 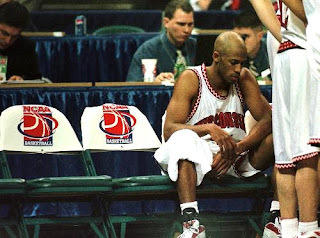 As much as the Final Four put the Badgers on the map and gave them respect, this NCAA tournament game from 1999 did a lot of work in the opposite direction. To put this in perspective, the Badgers, who were seeded 5th, scored 6 points LESS than the Badgers did against UCLA in the Rose Bowl that same year. Usually basketball teams score more than their football counterparts. UW easily scored the fewest points of any NCAA tourney team in the shot clock era, shooting 25.5%. I really can’t find anything positive that came out of this debacle. Except that UW made the Final Four the next year. While probably not directly correlated, it’ll have to do. Ron Dayne fumbles vs. Northwestern. This was such a kick in the gut for me that I honestly don’t remember that much about this play. I think that I must have blocked it out of my mind for mental health reasons. Or, it could be the copious amounts of beer I drank before heading to Camp Randall Stadium that morning. Anyways, the game is over, all you have to do is go into the victory formation and kneel on it. But UW puts their faith in Heisman Trophy winner Ron Dayne. And Dayne, who had been an absolute machine that game, mishandles the handoff with 40 seconds left. Then Northwestern goes 40 yards in what seemed like .2 seconds to win the game. If you're either a masochist or a Northwestern fan (if so, why are you reading this? ), check out the video on Dustin's blog post. Tie between 4 game sweeps vs. Cubs and Phillies in 2008. You remember these series, rig ht? In the first one against the Cubs, it was the ultimate battle for NL Central supremacy. Two new, but very heated rivals, duking it out in Miller Park or, as Cub fans call it, Wrigley Field North (there’ll be a post coming on this phenomenon in the near future). It was the end of July and the Cubs rolled into Milwaukee with a one game lead. They rolled out of town with a five game lead. I thought that it could not get any worse. Until the Brewers traveled to Philadelphia in September with a four game lead on the Phillies for the NL wild card. They left town tied for the wild card lead and minus a manager. At least the Crew rallied (if going .500 counts as a rally) and made the playoffs. But boy, after the Brewers were swept in the day/night double header to finish the Philly series, it had never hurt so badly being a Brewer fan. And as you know, we're quite familiar with pain. On a quick aside, while I was not exactly a Ned backer, I think that it was unfair to scapegoat him for everything that went on. 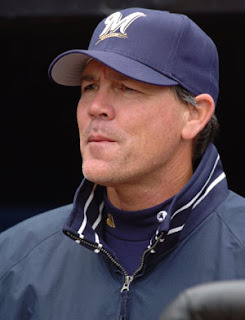 Honorable mention goes here to the 26 years between playoff berths for our beloved Brewers. 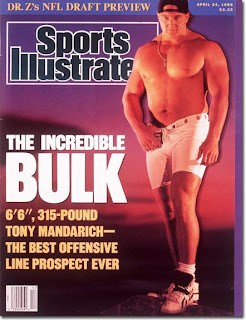 Mandarich could've ended up a HOFer and that magazine cover would still be eligible for the list.